A South Florida family says they were recently targeted by a terrifying kidnapping scam. 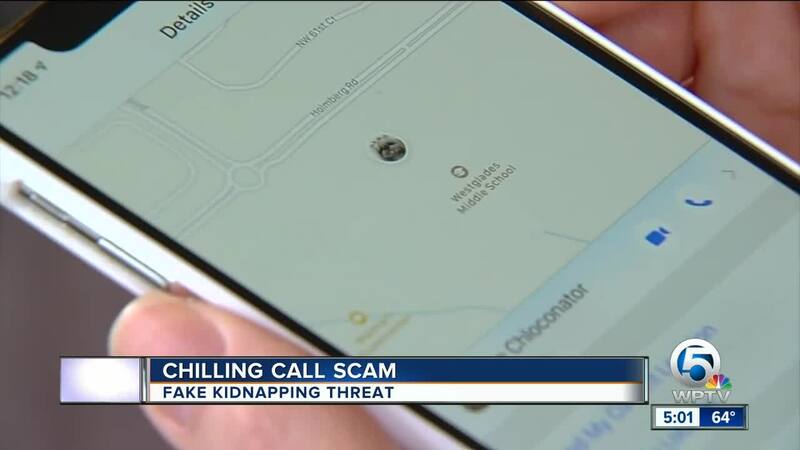 CORAL SPRINGS, Fla. — A Florida family says they were recently targeted by a terrifying kidnapping scam. Katie and Steve Watson live in Coral Springs, Florida and want to warn families about the crime. "All of a sudden a man's voice came on the line, and he said, 'Katie I have your daughter. She's in the back of my van,' " Watson told WPTV on Tuesday. Katie said she quickly hung up, feeling in her gut that it was scam. In the Watsons' case, however, the scam was taken to a frightening new level with the use of a whimpering child on the line. Attempt to contact the alleged victim via phone, text or social media, and request that they call back from their cellphone.